Stylish design, white crinkled voile attached over the blackout curtain, impedes most light and also give you an elegant and light experience. MOST SPECIAL CURTAINS! 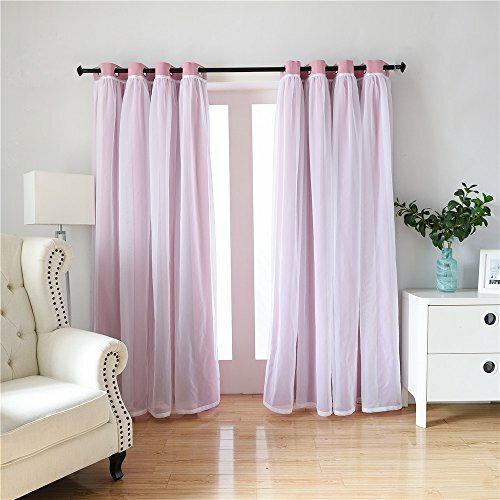 Didihou blackout curtains impede most light and UV ray (Dark color curtain works well). Noise reducing, better TV viewing thanks to the innovative triple weave technology. 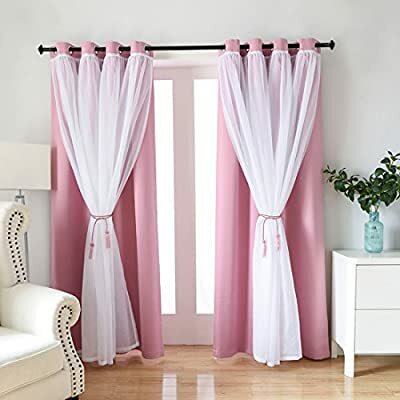 Didihou curtain is made of polyester, chemical fiber and viscose, easy to hang and designed with smooth and wrinkle free fabric, grommets (1.6 inch inner diameter) top, has the silky feel and luxury look. Protects your furniture, floors exposure to the sun, it will pay for themselves off over time. Thread trimmed and wrinkle free, silver ring with elegant visual with various lengths and colors to fit your existing interior theme. Didihou curtains are made to long last. Machine washable in cold water, tumble dry. Quick iron or steam clean when needed. Solid and bright colors, not easy to fade.
? MIX& MATCH WHITE VOILE x BLACKOUT CURTAIN - Stylish design, white crinkled voile attached over the blackout curtain, impedes most light and also give you an elegant and light experience. MOST SPECIAL CURTAINS! ? 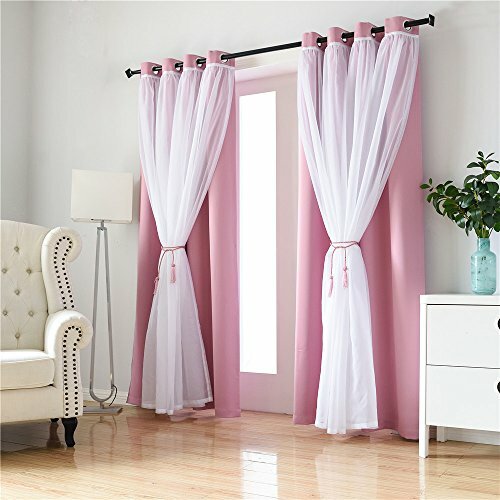 GREAT BLACKOUT CURTAIN - Didihou blackout curtains impede most light and UV ray (Dark color curtain works well). Noise reducing, better TV viewing thanks to the innovative triple weave technology. ? SILKY FEEL and LUXURY LOOK - Didihou curtain is made of polyester, chemical fiber and viscose, easy to hang and designed with smooth and wrinkle free fabric, grommets (1.6 inch inner diameter) top, has the silky feel and luxury look. Protects your furniture, floors exposure to the sun, it will pay for themselves off over time. 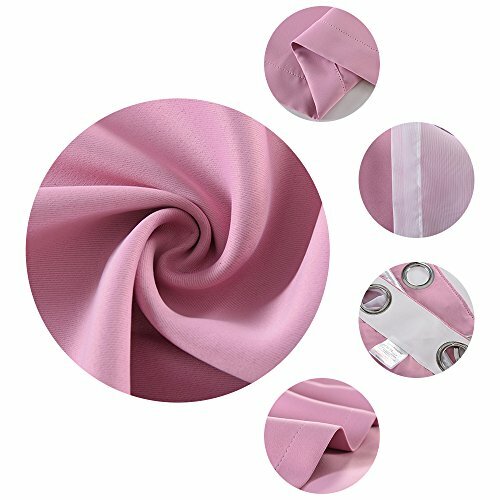 Thread trimmed and wrinkle free, silver ring with elegant visual with various lengths and colors to fit your existing interior theme. ? 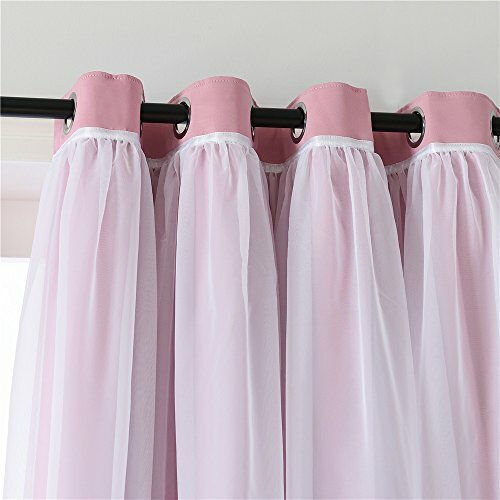 EASY TO MAINTAIN and CLEAN - Didihou curtains are made to long last. Machine washable in cold water, tumble dry. Quick iron or steam clean when needed. Solid and bright colors, not easy to fade. ? 30-DAYS MONEY-BACK WARRANTY - Any reason, all refund within 30 days.